56 1/4 by 51 in. 142.9 by 129.5 cm. Mitchell-Innes & Nash announces an exhibition of recent work by British painter Leon Kossoff, on view in the Chelsea gallery from May 5 – June 18. The exhibition will feature paintings from the past decade: Kossoff’s first new body of work to be exhibited since 2000. Following his 2009 exhibition at Mitchell-Innes & Nash of works from the 50s and 60s, it will show how Kossoff’s painting has evolved over the past several decades. A fully illustrated catalogue will accompany the show. The exhibition will include a series of landscape paintings centering on an old cherry tree in the artist’s garden. This leaning tree, propped up with two wooden stakes, has become an ongoing subject in Kossoff’s painting. Weathered, falling-down, but lovingly preserved, the tree comes to represent the passing of time and the artist’s lifelong investment in painting. Also included in the exhibition are a number of portraits. 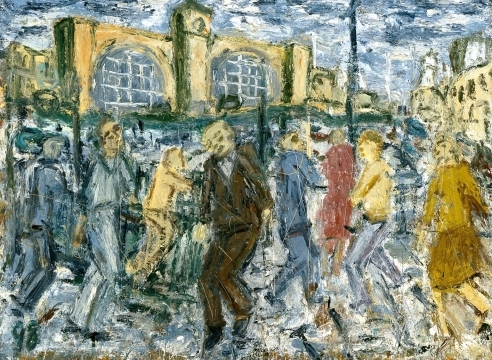 Kossoff regularly draws and paints the same subjects again and again: the environs of London, his immediate family, and a trio of loyal studio models. His approach combines a methodical investigation of form through paint, with emotionally resonant subject matter. Using slow and measured observation of his subjects, he often works and reworks his paintings for years. The surfaces of the paintings mirror the passage of time in the outside world, as signs of age and weather become evident. In this recent work, he has lightened his palette as well as his trademark heavily impastoed surfaces, for an overall effect that is painterly yet more pictorial. 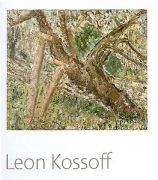 Leon Kossoff (b.1926) is one of Britain’s greatest living artists. Kossoff’s recent US exhibitions were Drawn to Painting: Leon Kossoff-Drawings and Prints after Nicholas Poussin on view at the Los Angeles County Museum of Art in 2001; After Nicolas Poussin: New Etchings by Leon Kossoff traveled to The Metropolitan Museum of Art and the J. Paul Getty Museum, Los Angeles in 2000; and, Leon Kossoff: Recent Paintings and Drawings at Mitchell-Innes & Nash. International exhibitions of note include Leon Kossoff: Drawing from Painting at the National Gallery, London (2007), Leon Kossoff: Selected Paintings 1956 – 2000 at the Louisiana Museum of Modern Art in Humlebaek, Denmark (2002), Drawn to Painting: Leon Kossoff-Drawings and Prints after Nicholas Poussin at the National Gallery of Australia and Annandale Galleries, Sydney in 2002; a major retrospective at the Tate Gallery in London in 1996 and Kossoff’s exhibition in the British Pavilion at the 1995 Venice Biennale.